The construction trades industry provides students with a wide variety of career options, along with competitive salaries. The Construction Trades program at the St. John Valley Technology Center focuses on the carpentry trade, and exposes students to basic masonry, plumbing and electrical training. Our program and instructor are both certified by the National Center for Construction Education and Research (NCCER), thus allowing our students the ability to earn various certifications that are recognized by employers and colleges around the nation, and even around the world. Throughout each year, students gain experience by working on different “live work” projects. 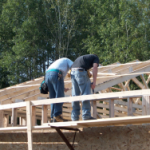 Students in Construction Trades II frequently work on full ground-up construction projects for local customers. 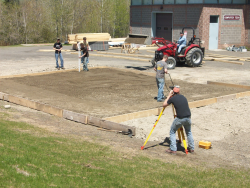 Students who successfully complete both years of the program earn 3 college credits toward the construction trades program at Central Maine Community College. Applying mathematical principles in this program gives many students their first deep understanding of the math they learned in geometry and even some algebra I classes.